Although this Alexander seedling originated near Wolf River, WI in 1875, it may be the most well known, old-time apple in Maine. 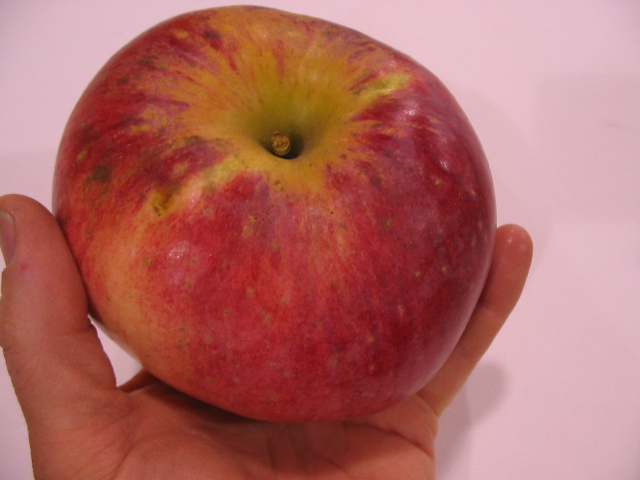 This is likely due to its catchy name and its extremely large—even huge—fruit. Whenever John has a Wolf River in an apple display, it is invariably the first apple that viewers pick up. They just can't resist the size. The pale, yellow-green skin is covered with pink, deep red and bright crimson. It almost always has a vivid yellow-green, russety splash around the stem. The creamy-white flesh is firm but tender. Some people love the dry fruit for fresh eating, but usually Wolf River is used for drying or baking. It is excellent for both. Since it is not particularly flavorful, it only makes a passable single-variety pie. We suggest mixing Wolf River with other juicier, more flavorful varieties in a pie. Because of its natural dryness, it is the best apple for Carol Gilbert’s famous “Walk About Pie”. To dry Wolf Rivers, cut slices right across the core and place them on a screen above the wood stove or string them and hang them in a sunny window, greenhouse or the attic. They dry in a couple of days.